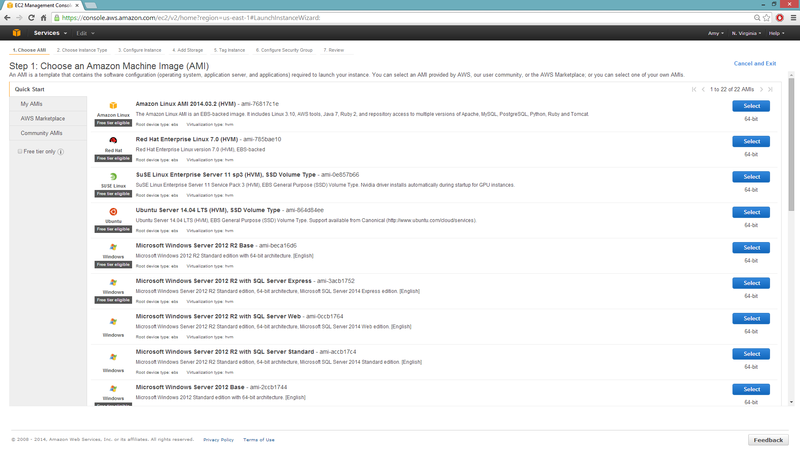 To use the Minio Cloud Storage, you will need to pass an endpoint in addition to access credentials. For security reasons, we recommend writing a script to read the access credentials that are stored in a separate file. This will not only keep your credentials from propagating to other locations, but it will also make it easier to change the credential information later. You can only specify one S3 endpoint. This means you can either read data from AWS S3 or Minio S3, not from both. We recommend using S3 for data ingestion and S3N for data export. When running H2O in standalone mode using the simple Java launch command, we can pass in the S3 credentials in three ways. You can pass in credentials in standalone mode by creating a core-site.xml file and passing it in with the flag -hdfs_config. For an example core-site.xml file, refer to Core-site.xml. Set the credentials dynamically before accessing the bucket (where AWS_ACCESS_KEY represents your user name, and AWS_SECRET_KEY represents your password). Note: Passing credentials in the URL, e.g. h2o.importFile(path = "s3://<AWS_ACCESS_KEY>:<AWS_SECRET_KEY>@bucket/path/to/file.csv"), is considered a security risk and is deprecated. Python and the boto Python library are required to launch a multi-node instance of H2O on EC2. Confirm these dependencies are installed before proceeding. For more information, refer to the H2O EC2 repo. Build a cluster of EC2 instances by running the following commands on the host that can access the nodes using a public DNS name. Edit h2o-cluster-launch-instances.py to include your SSH key name and security group name, as well as any other environment-specific variables. Note: The second method may be faster than the first because download pulls from S3. Distribute the credentials using ./h2o-cluster-distribute-aws-credentials.sh. Note: If you are running H2O using an IAM role, it is not necessary to distribute the AWS credentials to all the nodes in the cluster. The latest version of H2O can access the temporary access key. Caution: Distributing the AWS credentials copies the Amazon AWS_ACCESS_KEY_ID and AWS_SECRET_ACCESS_KEY to the instances to enable S3 and S3N access. Use caution when adding your security keys to the cloud. Wait 60 seconds after entering the command before entering it on the next node. To shut down the cluster, use your Amazon AWS console to shut down the cluster manually. Note: To successfully import data, the data must reside in the same location on all nodes. endpoint: Specifies a minio server instance (including address and port). This overrides the existing endpoint, which is currently hardcoded to be AWS S3. enable.path.style: Specifies to override the default S3 behavior to expose every bucket as a full DNS enabled path. Note that this is a Minio recommendation. Import the data using importFile with the Minio S3 url path: s3://bucket/path/to/file.csv. You can pass the AWS Access Key and Secret Access Key in an S3 URL in Flow, R, or Python (where MINIO_ACCESS_KEY represents your user name, and MINIO_SECRET_KEY represents your password). Note: Before launching H2O on an EC2 cluster, verify that ports 54321 and 54322 are both accessible by TCP. Select your operating system and the virtualization type of the prebuilt AMI on Amazon. If you are using Windows, you will need to use a hardware-assisted virtual machine (HVM). If you are using Linux, you can choose between para-virtualization (PV) and HVM. These selections determine the type of instances you can launch. For more information about virtualization types, refer to Amazon. 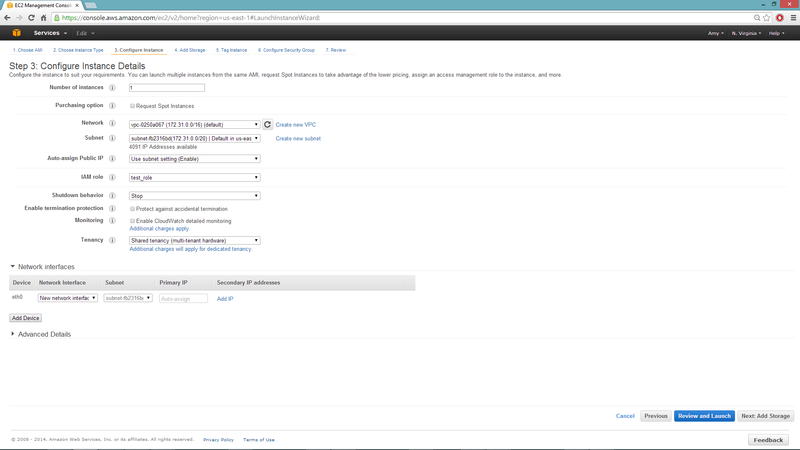 Select the IAM role and policy to use to launch the instance. H2O detects the temporary access keys associated with the instance, so you don’t need to copy your AWS credentials to the instances. 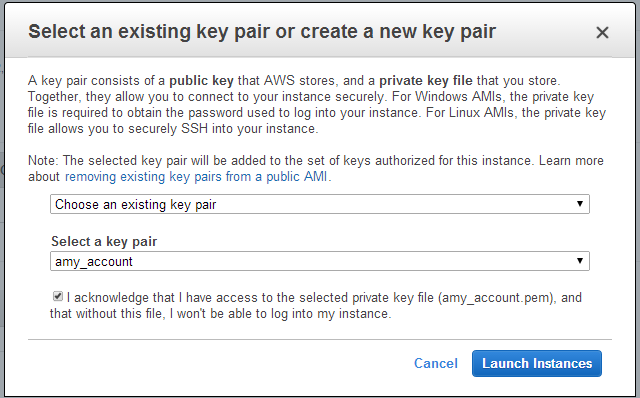 When launching the instance, select an accessible key pair. Launch the PuTTY Key Generator. Load your downloaded AWS pem key file. Note: To see the file, change the browser file type to “All”. Save the private key as a .ppk file. In the Session section, enter the host name or IP address. For Ubuntu users, the default host name is ubuntu@<ip-address>. For Linux users, the default host name is ec2-user@<ip-address>. Select SSH, then Auth in the sidebar, and click the Browse button to select the private key file for authentication. Start a new session and click the Yes button to confirm caching of the server’s rsa2 key fingerprint and continue connecting. Download Java (JDK 1.7 or later) if it is not already available on the instance. To download H2O, run the wget command with the link to the zip file available on our website by copying the link associated with the Download button for the selected H2O build. From your browser, navigate to <Private_IP_Address>:54321 or <Public_DNS>:54321 to use H2O’s web interface.